Until a couple weeks ago, that question could be answered very differently. A couple weeks ago, Tiger is Nike. Tiger is Gatorade. Tiger is General Mills. It's surprising that Gatorade dropped Tiger. "Is it in you?" seems oddly appropriate now. Tiger is Buick. Tiger is American Express. Tiger is Titleist. Tiger is Gillette. Tiger is EA Sports. Tiger is Accenture. Tiger is a red shirt on Sunday. Tiger is crouching on the green. Even the moniker “Tiger” is a brand name, something contrived, something borne out of imagination. These are all images of Tiger, and they can tell us what he is, but nothing really tells is who he really is. This reminds me of a line from the movie Anger Management, when Adam Sandler’s character first checks into Jack Nicholson’s support group. Nicholson asked Sandler who he was. Sandler would say his job, his hobbies, his interests, etc., but these answers were not good enough for Nicholson, who demanded Sandler look deep inside himself and tell the support group who he really is. Tiger, excuse me, Eldrick, had built this image of quiet, unshakeable poise on the golf course and in life that no one had ever really questioned. We like our athletes like that. They fit into neatly-packaged boxes. For example, LeBron James is Nike. LeBron is Upper Deck. LeBron is State Farm Insurance. LeBron is Vitamin Water. LeBron is the Cleveland Cavaliers (and possibly the New York Knicks). This whole TMZification of Tiger’s life is amazing because that force field between us and him was gone for a bit. Joe Posnanski put it best, that this Tiger we’re now seeing is different. He’s scared. No, I’m talking about that voice mail. His voice on the voice mail. That, friends, is something I suspect you have never heard before. That is Tiger Woods sounding scared. That is Tiger Woods seeming unsure, confused, clueless. That is Tiger Woods breaking under the pressure. But he’s human. We’ve all heard that voice. And I’m just imagining a golfer with a one shot lead over Tiger Woods with two holes remaining, and he’s feeling all those nerves, and he’s fighting all those inner doubts. And then, he hears that shaky Tiger Woods voice in his mind. And here’s the thing. Maybe Tiger Woods will hear that voice too. *If you haven’t already done so, please bookmark Posnanski’s amazing blog. It’s a must-read for me pretty much every day. 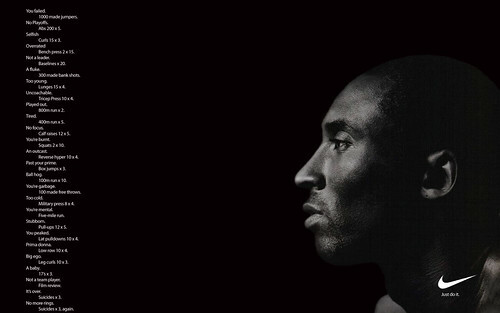 My rhetorically favorite ad... Kobe Bryant's first after the sexual assault scandal. Click to view the full-sized version. Web sites, to give their adoring public a glimpse of their marketable self. When this story broke, a lot of people compared Tiger’s scandal to that of Kobe Bryant, who was accused of sexually assaulting a 19-year-old woman in a Colorado hotel. Like the situation Tiger is going through now, every advertiser — Nike, Sprite, McDonalds, etc. — dropped Kobe. I’d like to compare Tiger’s plight with another Herculean basketball player, Michael Jordan. They both are/were tied to Nike and Gatorade, two major players in the athletic world. Michael, like Tiger, has a way of manipulating the media to get his message across. According to other reporters, he came off as some sort of demi-God, a person that we should be lucky to even see in a press conference, much less get a one-on-one interview. But reporters ate it up because, hey, it’s Michael Jordan. Then Michael Leahy wrote “When Nothing Else Matters,” and it showed how Jordan was more Monstar than Looney Tunes. It showed his controlling nature, his need for competitiveness and his desire for the spotlight. We’re seeing some of Tiger’s cracks now. How his situation differs is he’s in the prime of his career. He can rebound from this, and I believe he will. Michael Jordan will probably never be able to do so. Kobe can go out, drop 50 or 60 on the Pacers. Tiger can go out and putt circles around his competition. But the tarnish — that one look inside the endorsements and the theatrics and the marketing — that never goes away.